7x24 Exchange in Orlando just finished and I have a bunch of posts queued in my head. One is on the party on Tues night. Get ready for an incredible event with 7x24 Exchange—a special event that fills three different venues at Universal CityWalk® in Universal Orlando® Resort. Take a side trip to New Orleans at Pat O’Brien’s®, explore the home of the king of reggae at Bob Marley–A Tribute to FreedomSM, and take the stage atCityWalk’s Rising Star nightclub. Immediately following, you’ll enjoy desserts, rides and entertainment in The Wizarding World of Harry Potter™. In addition to taking in the sights and sounds of the incredible Hogsmeade™ village, you’ll also have access to thrilling attractions like Harry Potter and the Forbidden Journey™, Dragon Challenge™and Flight of the Hippogriff™! It’s an entire evening of magic and excitement—and it’s all yours! Now, you can argue that this type of event is not needed at a Data Center conference. There are plenty events that you pay more for and don't have theme park parties. One of the benefits of a good party though is people share their experiences. 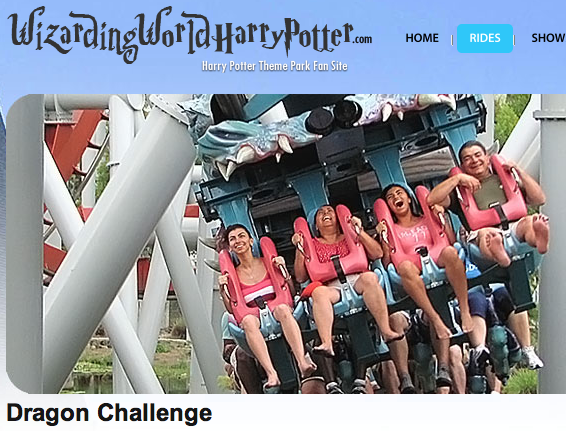 The gang I hang out got the first ride on Harry Potter Dragon Challenge. Skip the alcohol go straight to the best ride. No lines. Well there was a line of 8 people in front on us for the front row. We rode the third row which was fortunate because the third row has the seat for "big shoulder guys" which meant we could accomdate the big shoulder guy in our group, not me. The ride was awesome. We then went for beers, wandered around. We went back later and rode it again, but waited the extra 5 minutes to get in the front. The front row is way better than the back seats! How much better is the front? You can see the cooling towers!!! And, the experience is much better being thrown out in the front. Later we were chatting with a water treatment systems sales person, chatting about the Dragon Challenge. She told us how great the ride was and the ride operator said the best seat was in the back. We laughed. No way. The best seat is in the front. And, you can see the cooling towers. We went back for one more ride. She saw the cooling towers, and agreed she was oversold by the ride operator that the back was the best. How much better the front vs. back seat is a common debate amongst roller coaster fanatics. For data center geeks though, a view of the cooling towers clearly makes the front better than any of the seats to the back. If you go to Harry Potter Dragon Challenge, sit in the front, see the cooling towers. oh, that may be hard and painful waiting an hour or more. You should have joined us at 7x24 Exchange. We rode Dragon's Challenge 4 times, including the last ride of the night at 11:30, sat in the front three times and got multiple views of the cooling towers. And, we have told this story many times to friends we ran into who were at the park as well. A good party supports the sharing of the experience.